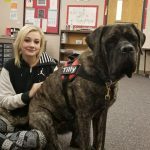 Canine Connection offers Therapy dog training and guidance for those of you who want to share your dog with the community. We will work on behaviors that are needed to pass the test and have mock sessions. 6 week session (meet one time per week Sugar Grove) 195.00 or Private sessions 100.00 per session in your home. Dogs must be 1 year or older at the start of class and have some formal dog training in the past, be well mannered and like other dogs. This class will build on previous obedience skills and guide clients through the process of preparing and taking the certification test. You will learn the ins and outs of volunteering at schools, hospitals and nursing homes. Owners will learn how a dog thinks and learns, this class is not just about individual skills but learning to connect emotionally with your dog and sharing your dog with the public.